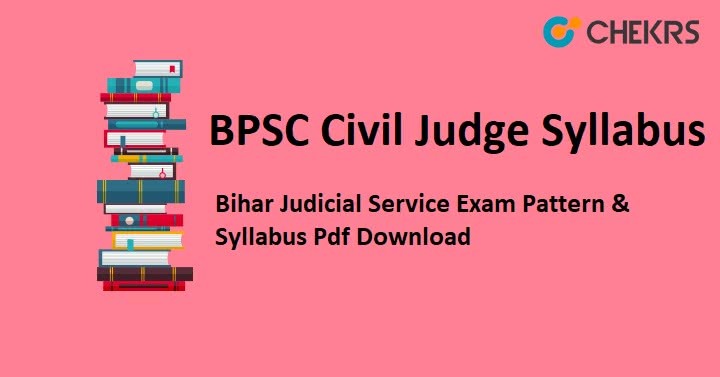 BPSC Civil Judge Syllabus 2019: Bihar Public service Commission (BPSC) is conducting Judicial Service Examination for Bihar students in November/December 2019. For the BPSC Civil Judge Syllabus 2019 takes a look of the entire webpage. All the interested and eligible students can apply for the examination before on the official website. Following the application, the reason for the stress of the students is the syllabus. So students for your help we are providing Bihar Civil Judge Syllabus 2019. It is mention in a proper format. Latest Update: Bihar Public Services Commission (BPSC) is going to conduct the Civil Judge Exam 2019. candidates can check the BPSC Civil Judge 2019 Syllabus from below. Interested and eligible candidates for Judicial Bihar Service read the below article of Bihar Judicial Service Exam Pattern 2019. Here we have described the exam pattern in a tabular form. There is no Negative marking in the exam. The prelims exam consists of two papers. And the main exam consists of five compulsory Papers and five optional papers, from the optional papers candidates have to select any three papers for the exam. Bihar Civil Judgee Exam Pattern gave below help you to make your exam strategy. Students Bihar judicial service exam will be conducted in November/December 2019, so now it’s your very peak time don’t waste it and do your hard work to get the target. For your support Bihar Judicial Service Exam Syllabus 2019 PDF link is provided in below article. Law of Evidence & Procedure. Consttitutional & Administrative Law of India. Hindu Law & Muhammadan Law. Law of Transfer of Property. Law of Trusts & Specific Relief. Law of Contracts & Torts. Remarks: We have tried our best to provide you with all the information about the BPSC Civil Judge Syllabus 2019. In Above Article we provided the Bihar Judicial Service Exam Pattern 2019. Candidates for your queries we are always ready so comment us in the comment box, our team will provide you solution in a short time period.